Coastal Virginia has a large and diverse tax base stabilized by the presence of the military bases. Our nationally ranked public schools and educational programs, low unemployment rate, and private sector job opportunities compounded with low crime rates attract newcomers to the area and keep locals close to home. Having the opportunity to live the life, beach-style, is what makes Coastal Virginia so appealing. The lifestyle is all about taking delight in our warm summers and mild winters. At the top of the leisure list – spending time with friends and family, relaxing or taking in a sport, and enjoying the diverse year-round outdoor activities. This is why Coastal Virginia continues to be ranked in the “Top 10 Best” places to live, raise a family and travel to, to name a few. There is something for everyone – whether your perfect day at the beach means joining the East Coast Surfing Championships at the Oceanfront, running in one of our coastal racing events, watching the sun set on the Chesapeake Bay, or basking in the wonderful solitude of a winter’s day on Sandbridge Beach. Coastal Virginia is nationally ranked for the areas of parkland and numbers of playgrounds per capita. The oceanfront features a 3-mile boardwalk and city maintained clean beaches. Virginia Beach alone boasts miles of hiking and biking trails, and 121 miles of waterways for boating, fishing, kayaking and paddle-boarding, and more. Visit wildlife refuges which protect endangered species like bald eagles and loggerhead turtles or venture out for a day of dolphin or whale watching. Coastal Virginia offers a lifestyle like no other for all ages. 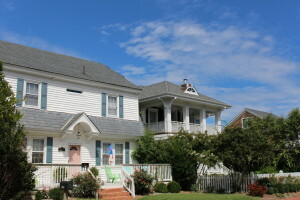 Whether the key factor for your coastal lifestyle is bay or ocean access for fishing, a view of the water from your deck, or simply an outdoor shower, Virginia Coastal Connection has just the right homes for you to see. Of course, for many, it is just as important to have the best schools within blocks from home and a neighborhood that just feels right. Please visit us often whether you are thinking of buying a home or selling – let us be your Neighborhood Resource. We will highlight different neighborhoods frequently and yours may be next – help us tell Your Neighborhood’s story!